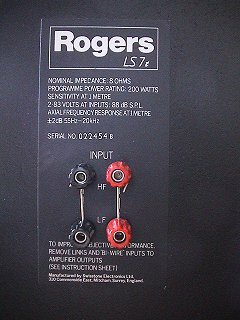 Back in 1996, I made the mistake of borrowing a pair of LS3/5As from work. Of course, it meant my old Musical Fidelity MC1s had to go! At the time, the second-hand price of LS3/5As was around £400, which I felt to be a bit much. After a bit of investigation, I discovered The Emporium in Diss, Suffolk. They offered me a loan of a pair of Spendor's BC-1, which were going for just £100, and a pair of Rogers LS7s which were priced at £200. It was an interesting week, as I still had the 3/5As, plus a pair of Spendor SA-1s that a good friend suggested as a cheaper alternative to the LS3/5A... My landlord was starting to seriously worry about me! Almost from the moment I heard the LS7s, I knew they were exactly what I was looking for. I normally refrain from making quick judgements until after a few different recordings because first impressions are often misleading, but this time, I was right! The LS7s became my main loudspeakers, and remained so for around 5 years, until I switched to the BBC LS5/9. The enclosure is made using classic BBC "thinwall" construction, but using cheaper MDF rather than birch plywood. The cabinet walls are 12mm and the baffle is 18mm. All walls except the baffle are damped with self-adhesive bitumen pads and lined with foam. The cabinet has a real-wood veneered which is stained gloss-black in my case. I'm not sure if that finish is original - it's possible they've been re-finished at some point. The bass driver is retained with decent machine screws and captive nuts, and the port opening is flared to reduce port noises. 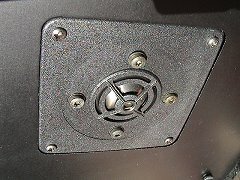 The tweeter and plastic connection plate on the rear panel (holding the crossover PCB) are secured with wood screws. Gaskets are used on every removable component to ensure good air sealing. Until I bought the ATCs, this was probably the biggest magnet I'd seen on a bass driver! It's nearly about twice the size of the LS2/14 used in the BBC LS5/9s. As an aside, note the "Swisstone Electronics Ltd" markings on the casting - I was never 100% sure of the exact relationship between Rogers and Swisstone, but thanks to a unique and fascinating article detailing some of the history of Rogers written by Brian Pook (MD of Rogers 1976-1982), I now know for sure what happened. Basically, Rogers went bust, but the decision was made to relaunch the company - even attending the auction to buy back items that the bailiffs had only just taken away! They needed to be an actual company to do this, so bought "Swisstone Electronics" for this purpose. As far as I can tell, Swisstone was just a vehicle, set up previously and left, awaiting a buyer. I don't understand many aspects of business, so as unusual as this might seem to me, it's quite probable that this is a fairly common practice. Feedback welcome! The accuracy of these results are not guaranteed! I made these measurements a little while ago while I was playing around with the LS7 driver in an LS5/9 cabinet (results were interesting, but didn't amount to anything - it was just a learning exercise). Still, perhaps they might be useful if you ever need to find a roughly equivalent replacement driver? That said, do bear in mind that the LS5/9 woofer is subject to ageing (the PVC surround hardens), so I wouldn't expect the LS2/14 results to be the same as a new drive unit. 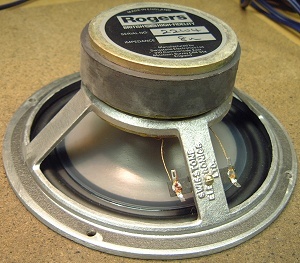 The crossover is quite complex for a typical domestic loudspeaker. Indeed, the topology is quite similar in to the LS5/9, but simpler because it lacks the comprehensive tweeter level adjustment. However, the description given on the page is equally applicable here. The only thing to add is the series inductor in the treble section (L3) - this will help to roll-off higher and ultrasonic frequencies, which might offer the tweeter some small degree of protection from HF oscillation or clipping in the power amplifier. I've not bothered to include any details of the Celestion HF1000 tweeter at this stage as it's the least interesting component in the design. It's arguably the weakest part, in my opinion. The criticisms in the review below mostly point to the tweeter, and I certainly feel that my objections can be attributed to it. I quite often receive emails asking about moddifying these speakers (and indeed, others on this site). From direct experience, I would advise caution. I tried changing the two electrolytic capacitors for expensive polypropylene devices, and the results were horrible! The midrange glare mentioned below was made much worse, and the original caps went back in a few weeks later! Electrolytic capacitors have well-known problems and limitations, and the designers working at Rogers back then were talented and experienced engineers. Quite simply, these limitations were accounted for at the design stage, and substituting "better" components will upset the balance. As for "upgrading" internal wiring, before doing this try to work out how much standard-quality copper wire is used for each inductor in the crossover, not to mention the voicecoil! 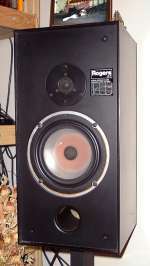 They were my main speakers for about 5 years. Happily my first impressions were largely confirmed. They have a very neutral midrange that make vocals sound worryingly natural. The imaging is very good and easily up to the standard of modern loudspeakers. 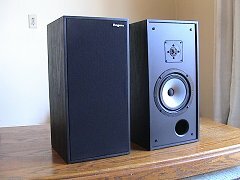 What impresses most is the bass - modern speakers just don't sound the same unless you're able to spend a large amount of money. It's very clear and natural, and doesn't sound boxy or boomy like some modern designs I've directly compared them to. I know this is a slightly strange thing to say, but if there's bass in the music, then you hear it. If there isn't, then you don't. I say that because there are too many loudspeakers that have higher and less well damped system resonances that always seem to sound the same, whatever the programme material, almost like the bass is failing to move up and down the scale like it should. Click here to read some interesting comments from visitors. Click here for a review of the LS7. On the whole, I like this review, for fairly obvious reasons. One thing I'd comment on is the "slightly 'edgy' and 'sibilant' treble" they observed: having heard CD players from the time, I wonder how much of that is a function of the source? I use mine without the grilles for the reasons given. And I've found that the 'rich' bass can be tuned by careful positioning. In the test room they were positioned a metre from each of the side walls and 0.8 metres from the back wall, firing down the length of their 13'9" by 18' listening room, whereas I listened to them across the width of my lounge, which puts them at least 1.5 metres from a sidewall. 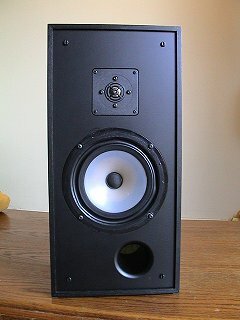 A few years back, I was offered another pair of LS7s, completely FOC - I simply had to pick them up. I am indebted to Lionel Smith for this very generous offer; simply, the LS7s were too large for him, and because he'd found the information on this website of interest, he wanted to offer them to me first of all. The next observation was the bass; well extended and tuneful as it was, there was definitely a hint of "slowness" to it. The Hi-Fi Choice review alludes to this. The issue is transient response, and the symptom is confined to kick drums - and mostly the electronic type in practice. So, this is probably not a problem for most listeners, but playing some '70s disco might show it up. I noticed it with "Tragedy" from the Bee Gees. Not that I'm a massive fan, you understand, but the kids enjoy a good bop to that sort of thing! Thanks are due to Andrey Tiurpenko for sending me these pictures and allowing me to publish them here. Note how the front edges of the sides, top and bottom panels are square - my older LS7s have a 45 degree machined edges that makes the panels seem thinner and lighter, but also leaves it slightly more vulnerable to knocks. The grill cloth appears to be a conventional material, as opposed to the heavy Tygan used on the original LS7s. The tweeter is clearly very different to the original Celestion model. Many thanks to Danko Suvar for identifying it as an MB Quart model, apparently a well-regarded model. As you can see, the port has been moved off the centre line and the chassis of the bass driver has been painted black. I wonder if any other changes were made to it? These models can be buy-wired, as the market demanded at the time. This is something that is easily done with conventional parallel crossover networks, so the tempation must have been overwhelming for manufacturers to do this - an extra "tick" on the reviewers check-list. As you can see, it's slightly simplified compared to the LS7. The bass section is almost identical, but lacks the impedance correcting network R3 and C2. The treble section is, not surprisingly, quite different. The inductor is used as an auto-transformer as well as a frequency-dependant component - the 15 ohm LS3/5A and LS5/9 use this trick.